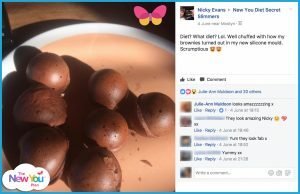 In this week’s community round-up, our Community Manager Candida gives us a sneak peek into what’s been happening in our Secret Slimmers & Momentum Maintainers groups. From amazing weigh-in results to fantastic achievements, it’s been another action packed week in our community, and we love it! It’s been a fabulous fun-filled week in Secret Slimmers with games, polls and spot prizes galore. So many of you have been engaging and taking part, having fun and losing weight at the same time. It’s definitely a win-win, which is what our community is all about! Helping you lose weight and enjoying the process. 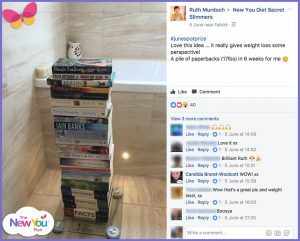 The June Weight Loss Challenge kicked off the week when we asked slimmers to find objects around their house that weighed as much as they had lost. There were some brilliant entries, which saw people really thinking outside of the box and making us laugh. It is incredible when you see an enormous pile of books, stacked high resembling just how much had been lost. Ruth Murdoch, one of our wonderful winners, did just this and the impact was phenomenal! Each day this month we will invite you to take part in one of our spot prize tasks. 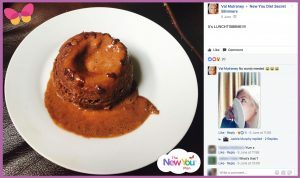 Let’s have some fun and lose weight at the same time! The first prize draw will take place this coming Monday. You lovely lot have been updating your losses and doing exceedingly well. So far there are an AMAZING 219 slimmers entered in to the challenge. Have you seen what incredible prizes we are giving away? A Fitbit, Smart Scales, a Nutribullet, New You products, and more. We do love to spoil you! 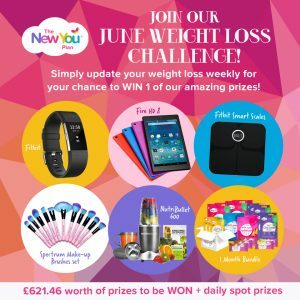 To be in with a chance of winning a prize this week, please make sure you have updated your weight loss by 7pm Sunday 11th June here. The prize draw will take place on Monday! So exciting! We often say on Secret Slimmers that your journey is unique to you. You can go as quick as you like or you can take it at your own pace. Taking the scenic route is fine as long as you never give up or veer off the path completely. It is totally your choice. It’s your body and mind so do what fits in with your lifestyle. Collette Butler, as you can see, is looking incredible. She took a slower route, fitting the plan in with her hectic life and it has worked wonders. 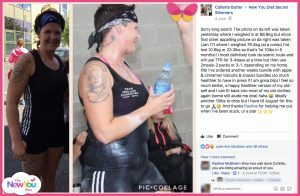 She said: “I feel so much better, a happy healthier version of my old-self and I can fit back into most of my old clothes again.” Brilliant Collette! The weight losses this week have been superb! In her very first week on plan, Bernie O’Sullivan lost a HUGE 12Ibs. She said that this is a “Great start to the final leg of my journey.” – You are smashing this Bernie! 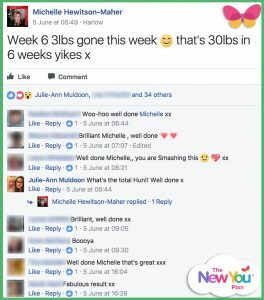 Michelle Hewitson-Maher is flying and one inspirational lady, having lost a whopping 30Ibs in six weeks!! WOWZERS! I was absolutely bowled over by Natalie Dunn’s post this week! 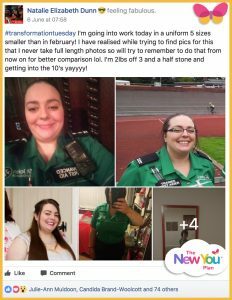 She said: “I’m going into work today in a uniform 5 sizes smaller than in February!” How incredible is that?! And she looks so happy and healthy! She committed to the plan and her dream of becoming a slimmer, happier person is coming true! It has been battle of the brownies this week. It is fabulous that you can be so diverse with New You products, utilising them in different ways to come out with spectacular results. I don’t think I would be able to choose between Val Mulraney’s gooey Choccy Brownie or Nicky Evans’ Brownie Pops. Both looked truly scrumptious! We love to see your foody pics so keep them coming! I am so looking forward to seeing all your weight loss results for the June Weight Loss Challenge! The PRIZE DRAW IS ON MONDAY! Woohoo! Who will win one of the spectacular prizes?? Have the most incredible 100% week. Be passionately committed to the plan and just wait and see what amazing things you can achieve!